North Korea’s increasingly belligerent posture along with a major increase in the pace at which it is testing advanced missiles and nuclear weapons pose a new set of challenges to the countries of the Asia Pacific Region. The International Strategic and Security Studies programme (ISSSP) of the National Institute of Advanced Studies (NIAS), organised a discussion meeting to take stock of these developments and their implications for regional security. 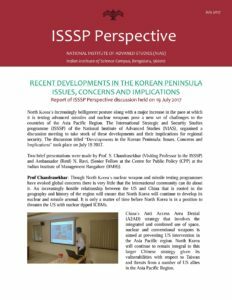 The discussion titled “Developments in the Korean Peninsula: Issues, Concerns and Implications” took place on July 19 2017. Two brief presentations were made by Prof. S. Chandrasekhar (Visiting Professor in the ISSSP) and Ambassador (Retd) N. Ravi, (Senior Fellow at the Centre for Public Policy (CPP) at the Indian Institute of Management Bangalore (IIMB)). The report was prepared by Dr. Prakash P with the inputs from Ms. Nasima Khatoon, Ms. Mirunalini Deshpande and Ms. Riffath Kazi of ISSSP, NIAS.